Suggested Learning Outcome: This fun paint craft will help children remember how Jesus served others and how we should serve others also. Step 1. Assist children with covering the bottom of one foot with washable paint. Allow the child to use the foot to make a footprint on the construction paper. Wash their foot and then do the other foot placing the heel of the second foot over the heel of the first print to create a heart shape. 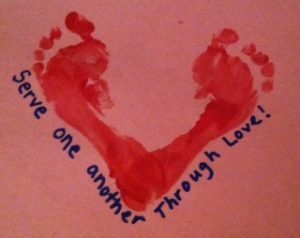 Allow to dry, and then assist children with writing the words, “Serve One Another Through Love” around the foot prints (see image).